Monkey Bars are a great addition to your climbing frame, amazing fun for kids that love to climb, hang and swing like monkeys. Monkey bars offer the perfect excuse for kids to monkey around while building their core strength and improving their motor skills. Using monkey bars will help children improve their upper body strength. This helps with posture and general physical well-being. 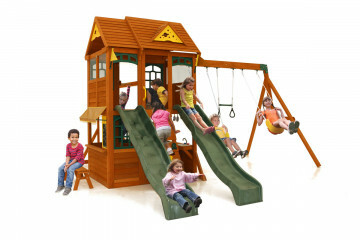 Our monkey bar climbers come in two varieties, the stand alone monkey bar, or the combination monkey bar and swings. Both have a ladder at the end, and easy grip rungs along the horizontal monkey climber. The monkey bars are normally about 1.8m (6ft) from the ground. Our monkey bars are manufactured from the same quality cedar wood as our climbing frames so they will come with a matching stain and wood finish. 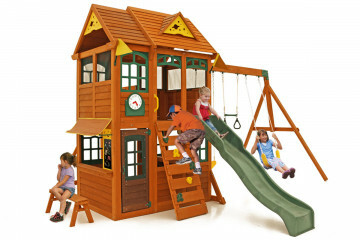 You can also be confident that our monkey bars will last, as cedar is resistant to rot, mould and insect infestation. They are specifically designed to be soft to touch so they are gentle on young hands so your children will spend more time enjoying their playset with no worries about splinters. Our combination monkey bar climbers also offer the opportunity to have swings and swing accessories attached to the beam too. 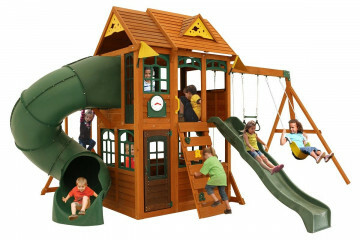 This offers the opportunity to maximise space in your garden, so if you have a smaller garden you can still have both a swing and a monkey bar so you children get maximum enjoyment from their playset. Safety Notice: We advise Swings & Swing Accessories should be removed from a combination monkey bar swing before using it as a monkey bar. Monkey Bars are a great addition to your climbing frame, such fun as kids love to climb, hang and swing like monkey's, you can buy wooden money bar climbing frames with play equipment or on their own. Monkey bars are a great addition to a climbing frame and our wooden monkey bar set can be added to most of our climbing frame models. Monkey bars offer the perfect excuse for kids to monkey around while building their core strength and improving their motor skills. Using monkey bars will help children improve their upper body strength, which will help with their posture and physical well being. 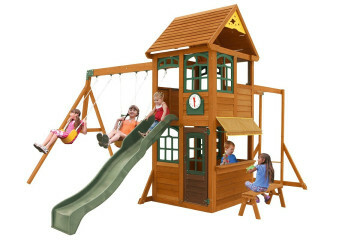 Our monkey bar climbers come in two varieties, the stand alone monkey bar, or the combination monkey bar and swings. Both have a ladder at the end, and easy grip rungs long the horizontal monkey climber. The monkey bar's are normally about 1.8m (6ft) from the ground. Our monkey bars are manufactured from the same quality cedar wood as our climbing frames so they will come with a matching stain and wood finish. 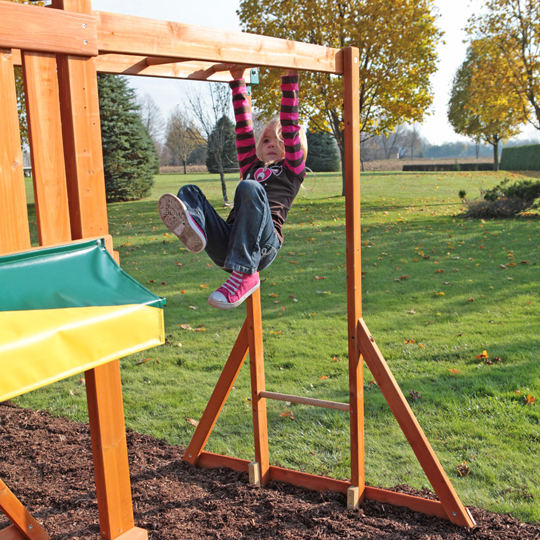 You can also be confident that our monkey bars will last, as cedar is resistant to rot, mold and insect infestation. They are specifically designed to be soft to touch so they are gentle on young hands so your children will spend more time enjoying their playset with no worries about splinters. Our combination monkey bar climbers also offer the opportunity to have swings and swing accessories attached to the beam too. 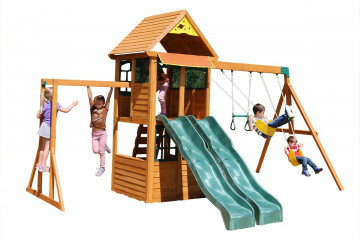 This offers the opportunity to maximize space in your garden, so if you have a smaller garden you can still have both a swings and a monkey bar so you children get maximum enjoyment from their playset. Safety Notice: We advise Swings & Swing Accessories should be removed from a combination monkey bar swing before using it as a monkey bar.